A portion of a “seemingly never-ending dispute” in New York Federal Court came to an end when a district judge dismissed a major part of a lawsuit filed by Vaad L’Hafotzas Sichos and Zalman Chanin against Merkos and Aguc”h over the printing of the Rebbe’s Sichos. 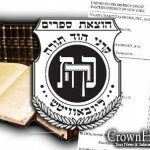 In a decision issued yesterday, the first day of Chol Hamoed Sukkos, senior district judge Frederic Block dismissed claims of copyright infringement and unfair competition which were brought by Chanin. This lawsuit was originally brought by Vaad and Chanin as a challenge against Merkos’s trademark of the Kehot logo in 2001 and again in 2011 in federal court. The plaintiffs claimed that the logo was simply a ‘spiritual mark’ and was not that of a publishing house. The plaintiffs claimed ownership and copyrights over the 29 volumes of Likkutei Sichos along with a number of other Seforim including: Hadronim Al Ha’Shas, Sefer Ha’Maamorim Meluket/Sefer Ha’Maamorim Bosi L’Gani, Biurim L’Pirush Rashi Al Ha’Torah, Biurim L’Pirkei Avos, Hilchos Beis Habchira Im Chiddushim Ubiurim, and Hagada Shel Pesach Im Likkutei Taamim, Minhagim Ubiurim. The judge recognized the plaintiffs “invaluable contribution to the publication to the Likkutei Sichos”, but said “It is equally clear, however, that their contribution was not of a type giving rise to a copyright in that work” and denied their copyright claim. In regards to the six other Seforim the judge said “It is undisputed that each of the six additional works registered by Vaad contains portions of the Likkutei Sichos. However, each also involves at least some modification of that work.” The only remaining Sefer which the plaintiffs have a claim to is the Haggadah and that matter will go before a trial jury. This article was updated to reflect a correction with regards to the Vaad’s claims that they were the exclusive authors of the Lekuttei Sichos. How many millions were wasted in courts over these disputes? How many of these millions could have gone to purchase property (which there is plenty of) to house Yiddin? How many millions did the CHJCC waste in frivolous lawsuits/blood libels*, that could have gone to help people? 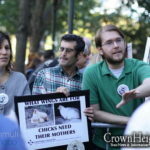 *As it turns out the only landlord that build for fellow Jews, is the one the CHJCC and their phony BD tried to lynch. While all their people (Sperlin family etc…etc…), don’t do anything for the Jewish community and in fact work against the Jews etc…Vdal. more about this to come. How many thousands did Yaakov Spritzer spend in court with his frivolous lawsuits? Thousands he could have used to purchase new property? There seems to be so much money for lawsuits/Mesira, but no money to build. Why is it that in other sects, when they fight, they build in the meantime (bigger and stronger, more shuls; more mikvas; more housing etc…etc..), while in Chabad, the attitude is, If I can’t have it, you can’t either!!! if the REbbe is not author who is??????? this likutey sichos where published by kehot before 1994? There is no copyright in oral speeches; copyright applies only to something fixed in a tangible form, i.e. writing or a recording. Therefore if the Rebbe didn’t write the sicha down before delivering it then he had no copyright, and the “author” for the purpose of copyright law is whoever first put it in a tangible form, i.e. the manichim. 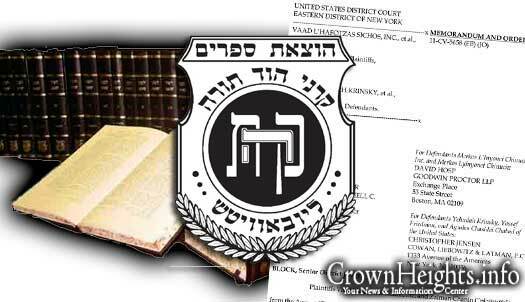 The Vaad went to the secular court, sued Rabbi Krinsky and Rabbi Friedman for twenty two millions dollars!!!! and then went on to testify that they are the authors of Likkutei Sichos and that the Rebbe had not that much input!! I just shipped my old set of Lekkutei sichot to Nachman Schapiros house asking for a refund! I bought the books with false information “The Rebbe’s Lekkutei Sichos” turns out that Nachaman and Aktien claim its the “Schapiro Altien who authored the Lekutei Sichot” Frankly I’m not intersted in their great works, I will wait for the Rebbe’s Torah to come out.. Thank you Chanin for bringing this great clarity to the world. Now its all clear, the words Shlita refer to Scahpiro and Altien as they claim its their book. Can some one say why this didn’t go to din torah? Did a rov give reshus yo go to court? What a chilul hashem and waste of money. And, one does not need to know the answer to the question: why no Mashiach?